String Inverter Market size in 2017 was valued over USD 4 billion and the annual installation will surpass 73 GW by 2024. 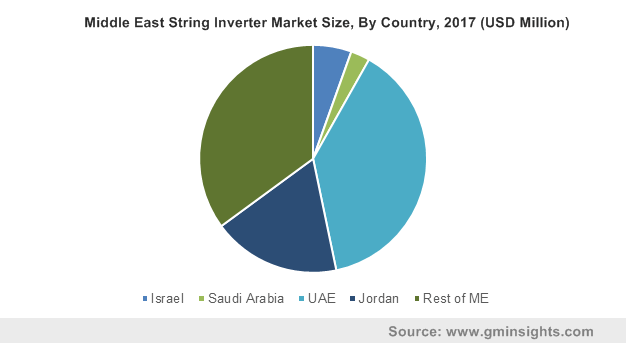 Global string inverter market will expand significantly on account of numerous government measures to accelerate the adoption of sustainable energy. In 2018, European Union has updated its energy policy framework with an aim to bind renewable energy of at least 32% from overall energy mix. The directive will positively stimulate the industrial competitiveness and will boost the demand for PV systems. Declining component prices on account of favorable tax benefit measures by regulators will significantly drive the market size. Improvement in primitive technologies along with volume manufacturing practices have led to considerable declination in the overall component prices. Anti-dumping duties implemented by the U.S. on various Chinese modules, depreciation in euro and yen, and the downward adjustment of the minimum import values is anticipated to further decline the prices in the near term. Single phase string inverter market have gained significant growth across residential and small commercial establishments owing to their effective operational feasibility. Over the forecast period positive regulatory prospects including feed-in tariff schemes will influence the product demand across the globe. Three phase will witness growth owing to its low cost, absence of inverter subpanel and compact size. In addition, the product ability to integrate with single-phase units makes it one of the preferred alternatives when compared to available counterparts. ≤500W predicted to witness robust growth across small scale photovoltaic applications. Manufacturer’s strong focus toward enhancement of the efficiency level and operational flexibility will augment the product demand. In addition, surging demand for cost-effective PV installations in line with growing off-grid deployment will expand the industry size. > 1500W power output is anticipated expand substantially on account soaring demand across utility scale projects. In addition, ongoing commercial and industrial expansion in line with the adoption of economies of scale executed by major industry participants will significantly up thrust the industry potential. ≤230V is projected to witness substantial growth of over 4% on account of rising demand from the community based off grid projects. In 2018, Soventix announced the setting up of 22 MW community based solar PV project across Seke Rural, Zimbabwe which comprises of 66,528 solar modules and 192 string inverters. Large-scale adoption across commercial establishments coupled with growing investments across utility aided solar projects will positively impact the demand for >400V inverters. 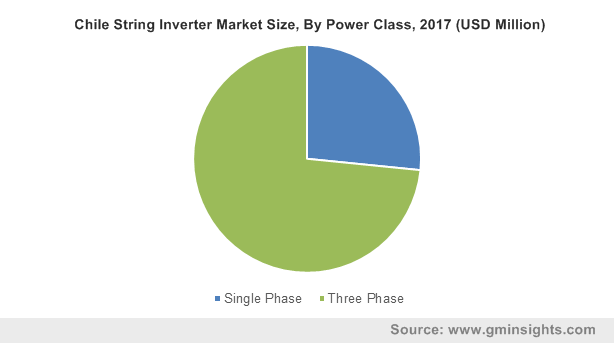 Stand-alone string inverter market was valued over USD 400 million in 2017. Growing adoption of decentralized power generation systems primarily across rural area along with increasing installation of micro-grid systems will positively impact the industry outlook. On-grid string inverter market will witness commendable growth on account of favorable regulatory measures toward the deployment large utility scale systems. Government focus to replace existing conventional power generating stations with the high capacity clean energy systems will propel the industry revenue over the forecast timeframe. 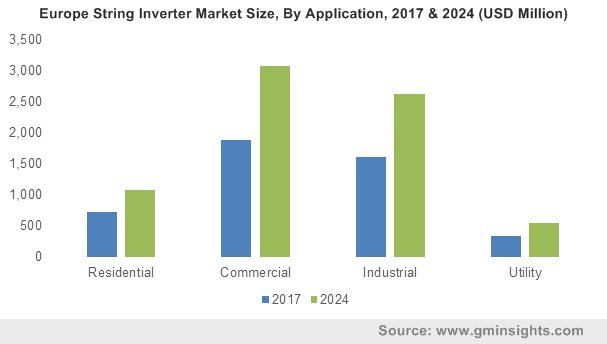 Residential string inverter market is anticipated to witness accelerated growth on account of declining component prices and advancement in the distributed generation technology. Government programs pertaining rural electrification will further add to the product demand. The Green Climate Fund in 2018 pledged to offer USD 27.54 million to the Burkina Faso’s Yeleen Rural Electrification Project. Industrial string inverter will witness growth on account of ongoing measures to reduce carbon footprints coupled with growing demand for clean and reliable power. In 2018, Tata power announced to develop 6 MW rooftop solar PV project across the refinery site of Mangalore Refinery and Petrochemicals Limited, India by using 95 string inverters. The U.S. market is anticipated to grow at a rate of over 4% by 2024. Federal norms to achieve clean economy structure by easing the impact of harmful emission and enhance the focus toward energy conservation will nourish the industry size. China market is anticipated witness substantial growth on account of stringent government target to install 60 GW of distributed solar PV system by 2020. As per the world resources institute in 2017 China’s accumulated installed capacity of distributed PV system accounts for over 27% of the country’s total photovoltaic installation. 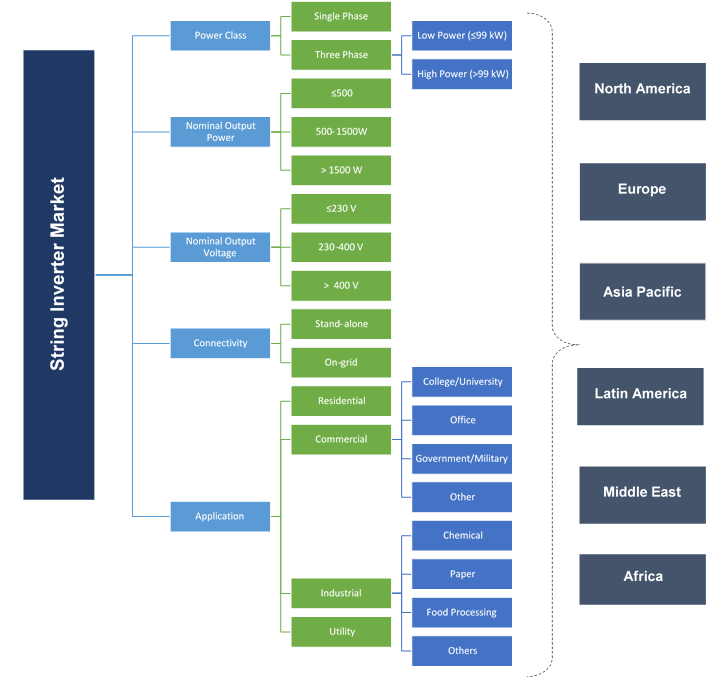 Notable players across global string inverter market includes: GoodWe, Ginlong Technologies, Elettronica Santerno, TBEA, SMA Solar, Sungrow, Fronious, Schneider Electric, REFU, Elektronik, SatCon, Solar Edge, Delta Group, Chint Group, Omron, Samil Power, Shenzhen KSTAR, KACO New Energy, SolarMax, Huawei, Growatt New Energy Technology, and ABB. Participants are investing aggressively in research and development activities to develop enhanced product which is anticipated to influence the business growth. For instance, in 2016, Sungrow introduced SG125HV string inverter having output of 125 kW which provide 1.5 DC:AC ratio with 99% efficiency. String inverters are the special type of inverters that are used to convert direct current into alternating current. It holds wide application across commercial and industrial sector. Growing adoption of rooftop and ground mounted solar PV systems due to their easy to install features and light weight along with declining component prices will drive the industry growth during the forecast period.